, a very learned Italian scholar of the seventeenth century, was born Aug. 31, 1651, at Borgo-san-Donino, in the duchy of Parma. In 1653 his father went to reside at Parma, where he spared no expence in the education of this son, although his fortune was considerably reduced by family imprudence. 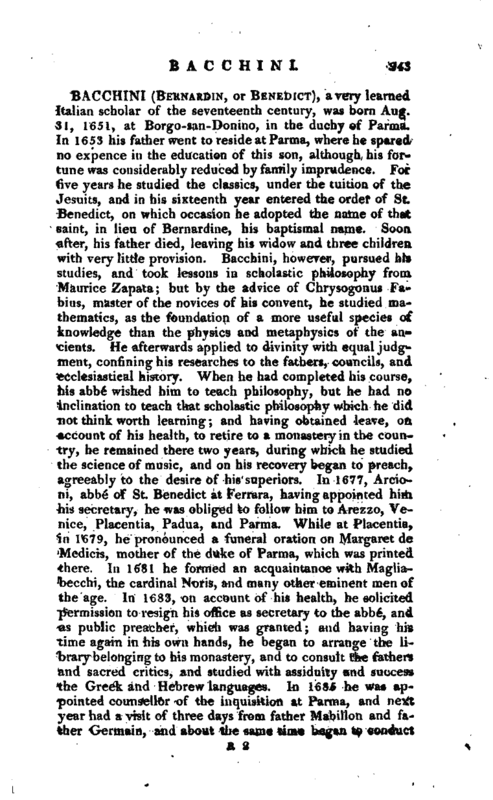 For five years he studied the classics, under the tuition of the Jesuits, and in his sixteenth year entered the order of St. Benedict, on which occasion he adopted the name of that saint, in lieu of Bernardine, his baptismal name. Soon after, his father died, leaving his widow and three children with very little provision. 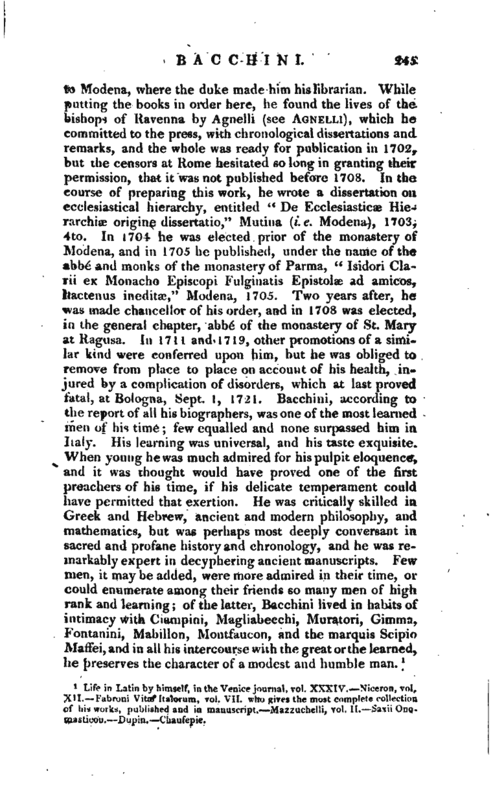 Bacchini, however, pursued his studies, and took lesson in scholastic philosophy from Maurice Zapata; but by the advice of Chrysogonus Fabius, master of the novices of his convent, he studied mathematics, as the foundation of a more useful species of knowledge than the physics and metaphysics of the ancients. He afterwards applied to divinity with equal judgment, confining his researches to the fathers, councils, and ecclesiastical history. 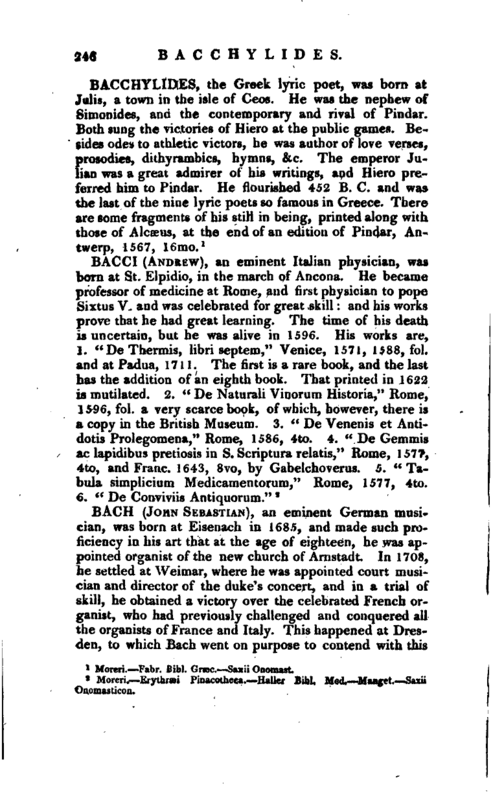 When he had completed his course, his abbé wished him to teach philosophy, but he had no inclination to teach that scholastic philosophy which he did not think worth learning and having obtained leave, on account of his health, to retire to a monastery in the country, he remained there two years, during which he studied the science of music, and on his recovery began to preach, agreeably to the desire of his superiors. In 1677, Arcioni, abbe of St. Benedict at Ferrara, having appointed him. his secretary, he was obliged to follow him to Arezzo, Venice, Placentia, Padua, and Parma. While at Piacentia, in 1679, he pronounced a funeral oration on Margaret de Medicis, mother of the duke of Parma, which was printed there. In 1681 he formed an acquaintance with Magliabecchi, the cardinal Noris, and many other eminent men of the age. In 1683, on account of his health, he solicited permission to resign his office as secretary to the abbe“, and as public preacher, which was granted; and having his time again in his own hands, he began to arrange the library belonging to his monastery, and to consult the fathers and sacred critics, and studied with assiduity and success the Greek and Hebrew languages. In 1635 he was appointed counsellor of the inquisition at Parma, and ne^t year had a visit of three days from father Mabillon and father Germain, and about the same time began to conduct | the” Giornale de Letterati." In this he was encouraged and assisted by Gaudentio Roberti, who was eminent in polite literature. Bacchini accordingly began the Parma journal, in imitation of that published at Rome, and continued it monthly, but without his name, until 1690. But afterwards, when at Modena, he resumed it for 1692 and 1693, after which, the death of Roberti, who defrayed all the expence, obliged him again to discontinue it. In 1695, however, Capponi engaged to furnish the books and all necessary expences, and he edited itfor 1696 and 1697, when it was concluded. The whole make nine small volumes 4to, the first five printed at Parma, and the rest at Modena. In the mean time, in 1688, the duke of Parma appointed him his theologian, at the request of Roberti; and the same year, at the solicitation of Leo Strozza, he wrote his dissertation on the ancient sistrum, a musical instrument, which was published under the title, “De Sistrorum figuris ac differentia ad illustriss. D. D. Leonem Strozza, ob Sistri Romani effigiem communicatum, ctissertatio,” Bononia, 1691, 4to. The death of the abbe Arcioni, and some disputes with his brethren at Parma, rendering it necessary for him to leave that city, the duke of Modena invited him thither in 1690, and soon after he was appointed first examiner, and then one of the counsellors of the inquisition. He had also the appointment of professor of sacred literature at Bologna, but on account of the distance he gave but few lectures, although he retained the title of professor. On the death of the duke of Modena, Sept. 1694, his uncle the cardinal d’Est succeeded him, and became a yet more liberal patron to Bacchini. 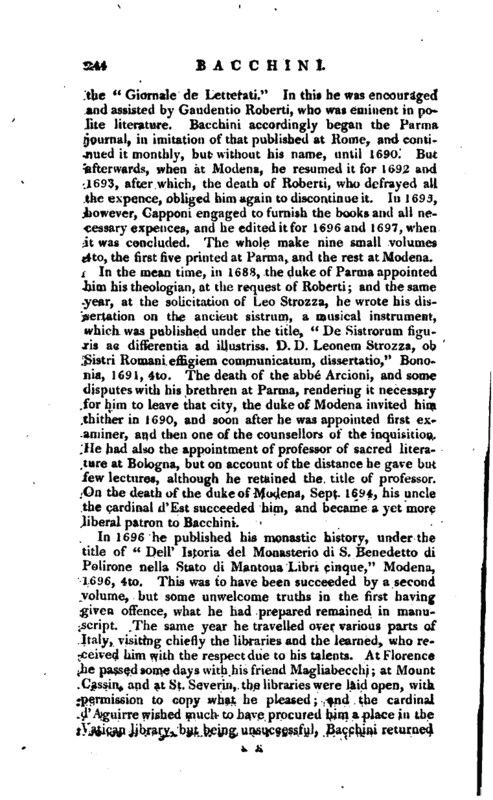 Life in Latin by himself, in the Venice journal, vol. XXXIV. —Niceron, vol. XII. —Fabroni Vitie Italorum, vol. VII. who gives the most complete collection of his works, published and in manuscript. JNlazzuchelli, vol. II. —Saxii Onomasticon. Dupin. —Chaufepie.